The Great British Bake Off season is well and truly under way, and having been diligently following the oven based drama for the last few weeks, I thought it was about time I started baking again. And also to enjoy the freedom while it lasts before I have to move back to uni and think twice about those electricity bills and the cost of ingredients. Besides, I was also becoming a serial ghost pinner on Pinterest and thought it was about time I started attempting some of those inspiring pins and see how it turned out. And I can safely say it wasn’t half bad. Although expectation versus reality did come into play a little bit… that may or may not have something to do with me using the wrong kind of spoon. I decided to go for Blueberry Muffins because I’ve never baked with fruit before and I had a craving for them, so the choice was set. This doesn’t have quite the same effect as Sue and Mel but without further ado, ready, set bake! Be warned I usually measure in cups, spoons and guesstimating, mainly because the scales are usually too far away. Then add the baking powder and salt. Also don’t do what I did and add 2 TABLESPOONS of baking powder, it’s definitely Teaspoons. Cream the butter and sugar until it’s smooth. I cheated halfway and used a mixer…however don’t do it too much because it ruins it slightly if it is too watery… I don’t know why but I know it just does. 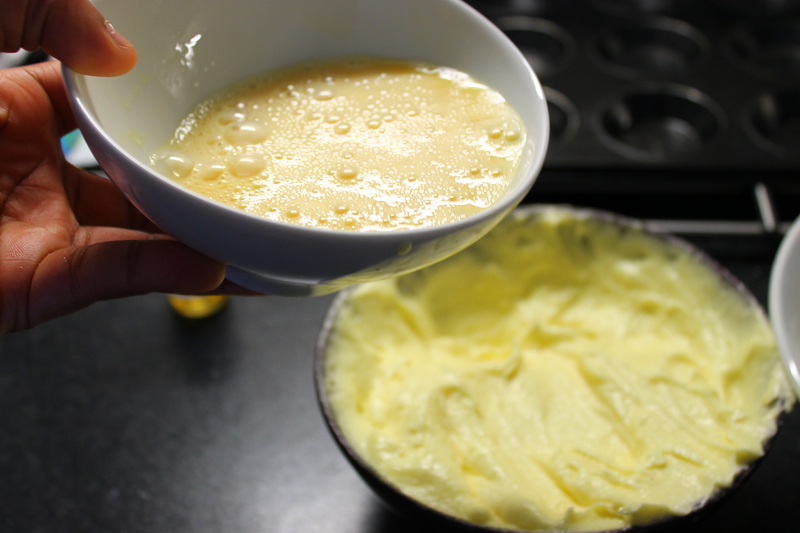 In a separate cup/ small bowl, add the vanilla and beat it together with the two eggs. When done, add to the butter and sugar mixture. Combine the flour mixture with the butter mixture, alternatively with the milk until it’s just blended. I prefer putting some of the flour mixture into a mug while I slowly mix the other half so it doesn’t get too much and lump together. Then put it in the rest of the flour at the end and mix. This comes out smoother and the process is less messy. Mix in the blueberries whole. I prefer to use an ice cream scoop and teaspoon to get even proportions. With the left over mixture I decided to make it into a hybrid blue cake. Enjoy the yumminess! It wen’t well with the Iced coffee I made earlier. … although for me that was after the cleaning! Actually that’s a good point…do the contestants on the GBBO have to clean up after themselves after each challenge? Hey Lorraine, thanks a lot for the link.